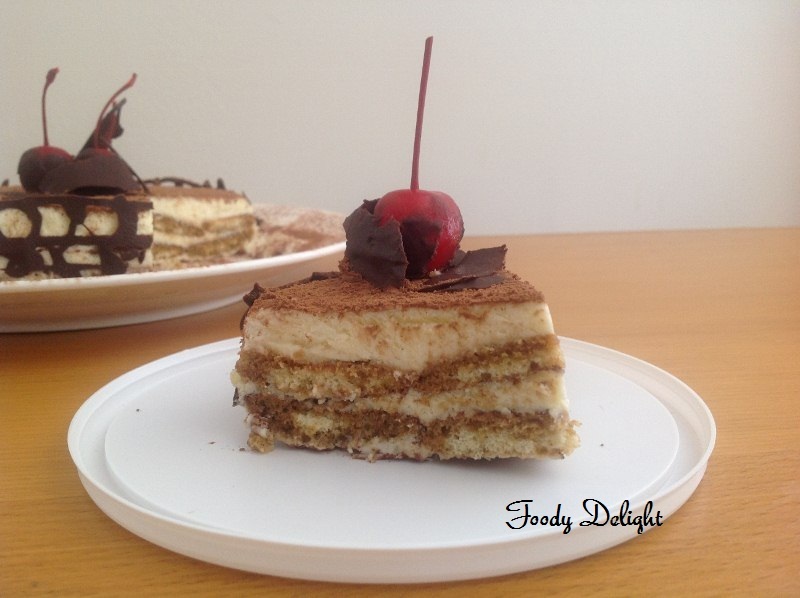 Tiramisu is the authentic Italian dessert. Tiramisu means "pick-me-up", that mainly refers to the contents of the strong coffee into it. In here coffee is induced at two stages, in the zabaglione and in the ladyfingers. And this is very true that the strong flavor of coffee makes the dessert more special. 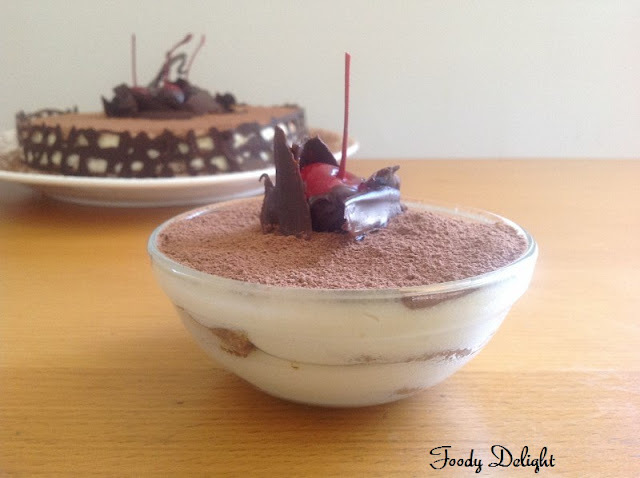 Tiramisu can be made with/without alcohol and I prefer the non alcoholic version. Tiramisu is the dessert that is alternately layered with the coffee soaked ladyfingers and egg custard cream, which is often topped off with cocoa powder. The egg custard cream is the blend of zabaglione cream, vanilla pastry cream, whipping cream and mascarpone cheese. For the veggie lovers, you all can skip the zabaglione cream and vanilla pastry cream and replace it by the simple custard cream (using milk and vanilla custard powder). 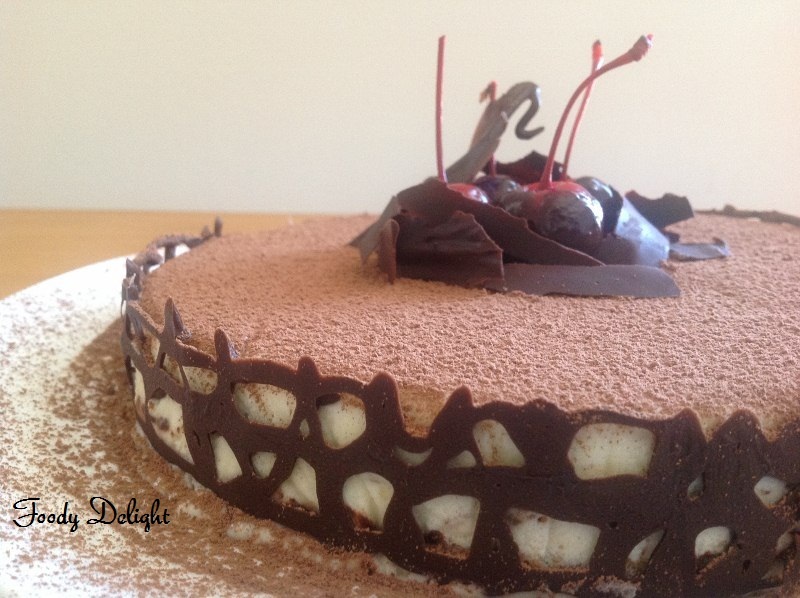 Though the dessert needs lots of preparation, it is not at all complicated if you do it by plans and lots of patience. 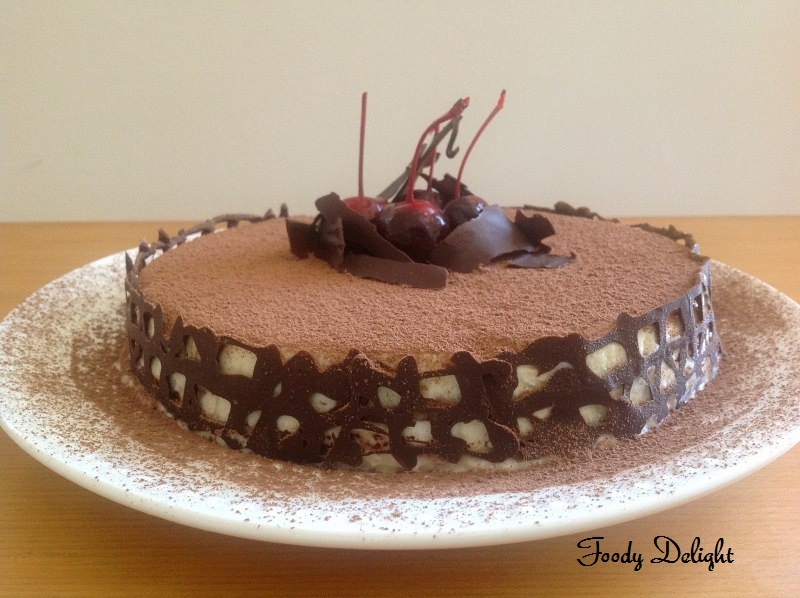 I chose to make everything by my own starting from Ladyfingers to Mascarpone cheese. 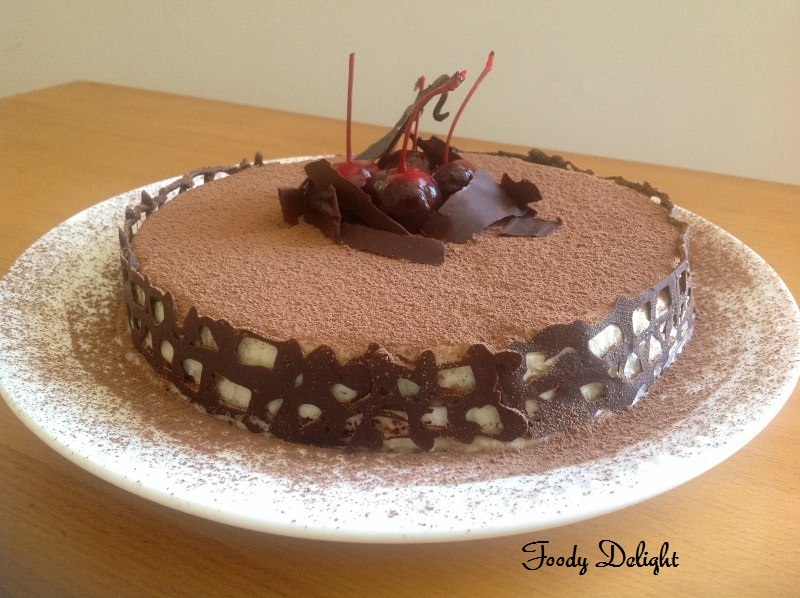 Tiramisu can be decorated as you please . Pour the cream into a medium heat-resistant bowl, then place the bowl into the skillet. Heat the cream, stirring often, to 190 F. If you do not have a thermometer, wait until small bubbles keep trying to push up to the surface. It will take about 15 minutes of delicate heating. Add the lemon juice and continue heating the mixture, stirring gently, until the cream curdles. Do not expect the same action as you see during ricotta cheese making. All that the whipping cream will do is become thicker . It will cover a back of your wooden spoon thickly. You will see just a few clear whey streaks when you stir. Remove the bowl from the water and let cool for about 20 minutes. Store them in an airtight container till required. They can be kept for 2 to 3 weeks. Makes about 24 to 25 (5 inch long) big size ladyfingers or 45 (2 1/2 inch long) small size ladyfingers. In a large mixing bowl (or stainless steel mixing bowl), mix together the egg yolks, sugar, the marsala wine (or espresso/ coffee), vanilla extract and lemon zest. Whisk together until the yolks are fully blended and the mixture looks smooth. Combine the cream, sugar and vanilla extract in a mixing bowl. Beat with an electric hand mixer or immersion blender until the mixture holds stiff peaks. Set aside. Have ready a serving dish (about 8" by 8" circular shape) or one of your choice. Mix together the warm espresso, rum extract (I did not used) and sugar in a shallow dish, whisking to mix well. Set aside to cool. To serve, carefully remove the plastic wrap and sprinkle the tiramisu with cocoa powder using a fine-mesh strainer or decorate as you please. Cut into individual portions and serve as you can see in the above image. wow!! looks amazing!! itz just crave me!!! You seem to be a 'dessert queen' ! You have super prefectly..incredible tiramisu. 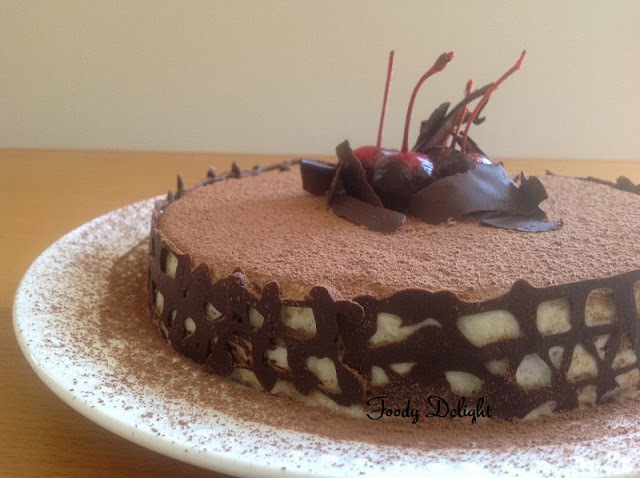 Very delicious yummy tiramisu..mouthwatering here!! I love tiramisu! Yours looks absolutely delicious!